I mentioned in my long ago previous post that my boyfriend and I had just purchased our first home. Well, as you can see the interior is pretty retro, though sadly not in the cute, hip, etsy sort of way. We have been doing a lot of DIY renovations, and though stressful and time consuming, it has also been such a rewarding experience to put my design skills to the test and recreate a whole house interior to my own specific tastes (Well, almost my own. There was my boyfriend to consider as well, and yes, there were fights, but we still love each other <3.). It’s hard to believe it was only a year ago I was working with my parents on their bathroom renovations. Granted, my budget as a just starting out 20-something was quite different ;), but that’s where creativity comes in! Our home hardly resembles these before pictures now, and we are nearing the home stretch. I don’t want to post any photos until everything is completely transformed, so be sure to check back later for the big reveal. I am a person who fancies many different aesthetics, so the hardest part was deciding exactly what way we wanted to go with our renovation. Here are some of my favorite DIY renovations I’ve spotted for each major room. Trees and other nature forms are one of my favorite accents for interiors because their shapes and sizes are limitless, and at least for me, bringing the outdoors in has calming qualities. Decals including the one shown above are available everywhere online, but can be pricey (This one would end up totaling $150 for all 3 pieces.). Simple branch forms are something even a non-drawer can put on their wall if they make a pattern or outline on the wall before painting. When you do it yourself, not only do you save money but you have more control over the color and shape of your design. A wall design should fill blank space to make a room look more balanced, and compliment the arrangement and flow of the furniture placement, as seen above. If you spend any time on Pinterest, you will know that Scrapbooking paper has become as all purpose as duct tape. 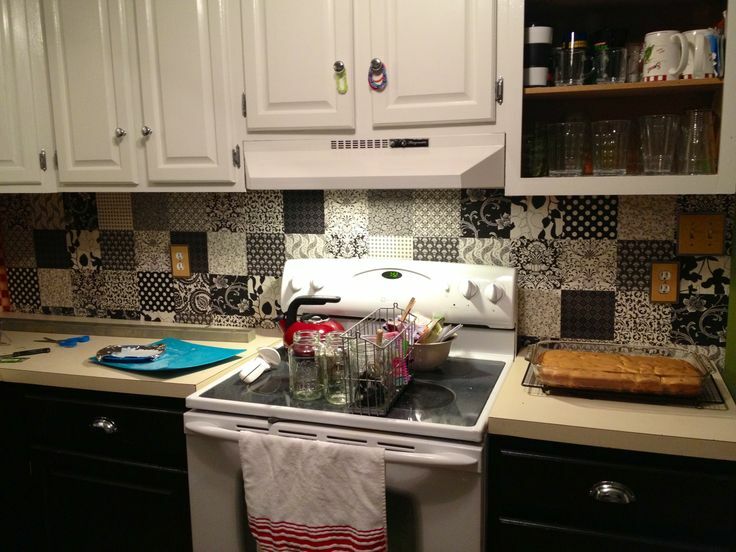 You can even use it to create a unique, artsy looking backsplash. Tile can be ultra expensive, but you can still get a fun tiled look using squares of scrapbooking paper, affixed and sealed with mod podge or any other clear sealer. From my experience, mod podge can sometimes still have a slightly “sticky” feel even after cured. There are a variety of other slightly more expensive sealers available at any local craft store that provide a better finish. It is key to use a gloss finish so any food splatters can be easily wiped off, and to remember that if your surface your are affixing the decoupage to is bumpy or rough, your finished design will be bumpy and rough. Sanding is your friend when affixing any sort of backsplash :). What’s great about this superhero themed bathroom from DIY Network is that once you repaint the shelving, change the accents, and switch out the comic book style artwork it can be re-themed at the home owner’s whim. I am a big fan of leaving the bones neutral so that you are not locked into a certain theme or style forever. Though this design was themed as a “little boy’s” bathroom, I personally believe it could also be a fantastic adult woman’s bathroom ;), and was actually planning on doing a superhero themed bathroom in our house until we happened to find a home with dreamy vintage floral wallpaper that we wanted to save. For whatever reason, I hate headboards. However, I am obsessed with finding ways to add extra shelving and storage in general. My boyfriend and I are both bibliophiles, so I thought this unique setup from Better Homes and Gardens was a great way to provide adequate shelving for books while staying space efficient, and giving a finished headboard look by bordering the top of the bed with blank wall. The sconces for extra reading light are a great functional idea as well. If you love color but don’t actually want to commit to rainbow walls, taping up paint swatches is an easily changeable idea. I love the creative genius vibe from the picture on the left, and can easily imagine notes and project ideas scribbled on each of the swatches as well, using the decoration as a kind of living idea board. If you find that look too chaotic, there is the more contained, orderly version on the right. The final step in any interior re-do, which I will be starting on soon, is filling in with finishing touches such as artwork and other decor. These small final details often make the biggest impact in your space. Don’t just buy canvas prints from Bed Bath and Beyond, it is worth searching the online marketplace for original designs by working artists that are oftentimes more affordable and so much higher quality than mass produced, big box store pictures. Some wonderful sites include Redbubble, Society6, Zazzle, Ebay, and DeviantArt. It’s also worth checking out the Facebook marketplace if you use Facebook. I sell original artwork and prints on many of these sites, and have included links below. I also work with my art students, who are primarily adult artists with disabilities, in empowering them to market and sell their artwork in both our organization’s Ebay Store and Redbubble Shop. Besides art prints, many of the students enjoy glass and ceramics painting which make for great one-of-a-kind accent pieces. A) Within walking distance of Mooney’s Ice Cream. I don’t need to explain what an asset this is. In a list of cohabiting concerns, not being close enough to 30+ delicious varieties of ice cream cones at whim was right up there with having stinky socks piled on top of my reading chair. So basically, a pretty big deal. B) I’m on the second floor and have a fun little balcony that is just excellent for drinking wine upon at night on summer evenings. We call it the veranda … what are delusions of grandeur again? Going back to the apartment thing; in a one or two bedroom apartment, it can be hard for your kitchen to really feel like a kitchen when it’s about 15 square feet. Oftentimes this space gets ignored. A brightly colored or fun patterned teapot sitting out on the stove top can wake it up a bit and make it a little more inviting, which is a good thing when you have just had the longest day ever and know you have to go home and cook ;). Art from different times and cultures. Another simple way to add interest is to mix in some vintage here and there, and add elements inspired by cultures different from your own. The collection above are all pieces I have up in my apartment. I have always loved retro 1960s illustration and art nouveau, and have been interested in asian culture since junior high. Your inspiration may be different, but either way including vintage and multicultural design will make any space more intriguing and inspiring to live in. Especially in an apartment, you don’t get to choose your major lighting fixtures, and the ones that are up are usually pretty bland and unassuming. So, you have to express yourself with your lamps. You can’t always have a chandelier or some other eye catching fixture on your ceiling, but you can have it on your end table :). I had to include that unicorn one on the end just for fun. When you have a small space with an open floor plan, rugs are awesome for visually dividing your space into “rooms”, different areas of function so that your space doesn’t just look like a jumbled sea of furniture. They can also add a bold design element, like art on your floor! For someone like me who likes to change things up every other month, it’s a good idea to keep your main staple pieces a neutral color. Plenty of fun contrasting patterns keeps it from being boring. My houndstooth and zebra print accented sofa purchased at an employee discount makes my full year of misery working in sales totally worth it. I love vintage glassware. I’m an antique store addict, and swear I have accumulated enough retro goblets and wine glasses to open my own bar.Everyone needs a contingency plan, right? My favorite antique glass is LE Smith’s Moon and Stars design, shown above. Glass from the 20s through 80s comes in nearly every color under the rainbow so there’s something to match everyone’s favorite color. Kids Stuff (Whether You Have Kids Or Not). When we’re a kid, we dream about the day we will have our own place. We envision building a slide that takes us from one floor to the other, and an entire room that’s just a gigantic ball pit. Then we grow up and become boring. I am a big believer in injecting a bit of fun into the place you’re going to go to sleep in at night, and have no problem paying homage to a favorite cartoon character here or there. I have a spider-man plaque hung up in my bathroom, and for awhile even had his and hers matching spider-man loofahs (I was Spider-man, he was Venom.). Finally, he complained that they were too small and made for children and can he please have a normal cleaning apparatus for when he stays over! They shot water out of their mouths when you squeezed the vinyl character sitting atop the fluffy cleaning part, that is an important point to be made. His loss. I don’t know if these fun little patterned boxes have an official name, but all I know is they make having piles of crap look chic as hell – enough said. What are some of your go-to’s for an intriguing living space?